* The discount is calculated on the amount that will result from the calculation of any discount granted on the basis of the consumption profile. The offer only applies to services in the Interconnected Network Operator with total annual consumption up to 1GWh / year. Valid for new applications until 30/04/2019, on 12month contract. 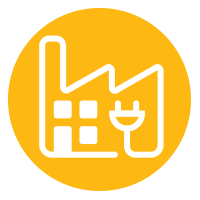 For Medium Voltage customers, Protergia offers customised solutions tailored to the particular consumption characteristics of each business. Based on the consumption data for a full year, we carry out an analysis of your energy requirements profile so that we can put establish the best possible proposal for your business. Regulated charges are the same for all consumers, depending on the particular tariff category and irrespective of the electricity supplier selected. They comprise the charges levied on all consumers who use the electricity infrastructures (i.e. the Hellenic Electricity Transmission System and the Hellenic Electricity Distribution Network), the charges for the provision of Services of General Interest and the Special Duty for the Reduction of Air Pollutant Emissions. Other Charges refer to charges in connection the orderly functioning of the market, the operation of the Hellenic Transmission System and the assurance of adequate capacity. To see all available payment methods, click here .